Here we writing study note on atomic bonds.The arrangement of atoms in a material determines the behaviour and properties of that material. Most of the materials used in the construction of a nuclear reactor facility are metals. Matter, as we know it, exists in three common states. These three states are solid, liquid, and gas. The atomic or molecular interactions that occur within a substance determine its state. Solid matter is held together by forces originating between neighbouring atoms or molecules. These forces arise because of differences in the electron clouds of atoms. In other words, the valence electrons, or those in the outer shell, of atoms determine their attraction for their neighbours. When physical attraction between molecules or atoms of a material is great, the material is held tightly together. Molecules in solids are bound tightly together. When the attractions are weaker, the substance may be in a liquid form and free to flow. Gases exhibit virtually no attractive forces between atoms or molecules, and their particles are free to move independently of each other. 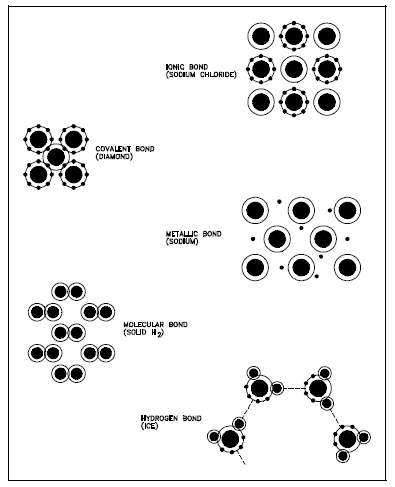 We can categorised atomic bond different way by their different bonding arrangements. those are discussed bellow. Ionic bond – In this type of bond, one or more electrons are wholly transferred from an atom of one element to the atom of the other, and the elements are held together by the force of attraction due to the opposite polarity of the charge. part of both atoms and both shells are filled. Metallic bond – In this type of bond, the atoms do not share or exchange electrons to bond together. Instead, many electrons (roughly one for each atom) are more or less free to move throughout the metal, so that each electron can interact with many of the fixed atoms. Molecular bond – When the electrons of neutral atoms spend more time in one region of their orbit, a temporary weak charge will exist. The molecule will weakly attract other molecules. This is sometimes called the van der waals or molecular bonds. Hydrogen bond – This bond is similar to the molecular bond and occurs due to the ease with which hydrogen atoms are willing to give up an electron to atoms of oxygen, fluorine, or nitrogen. Hope this discussion study note on atomic bonds clear your concept. Next PostWhat is Computer operating systems?